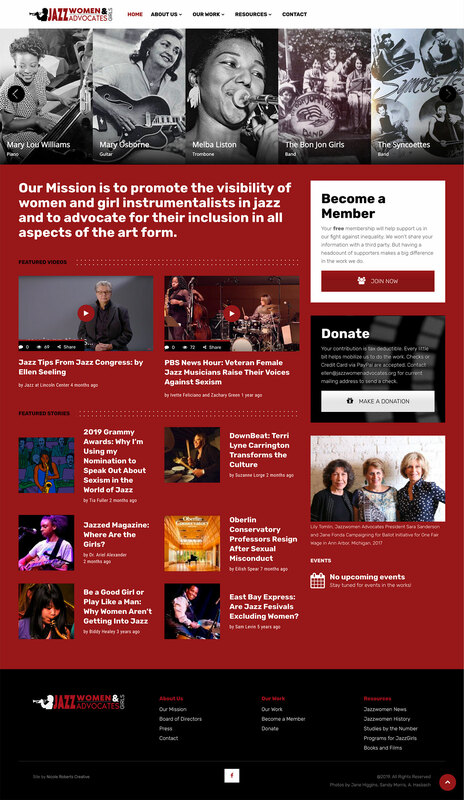 Nonprofit organization Jazzwomen & Girls Advocates needed a strong identity and online presence to do the advocacy work they do. The website needed to receive donations and offer membership to supporters. Featuring videos and articles from external sources to inform users about equality in the music industry today as well as an anthology of books, films and articles to educate about the women that have always been part of Jazz history. Photography of women in music is featured on every page header showing not so much the typical vocalist that we always see but the skilled instrumentalists that need the visibility and advocacy for equal pay.